When people find out you enjoy cooking, they often tell you about some of their more interesting recipes. 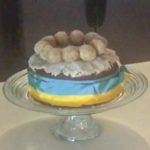 That’s how I learned about Simnel Cake and how easy it is to make homemade marzipan. My friend Erich told me about the history of Simnel Cake and that he and others made them for Laetare Sunday at the church he attended in New York. You can read his post about it here. He’s someone who makes his own candied peel and his own marzipan for this historic fruitcake. Erich calls himself a home cook, but he’s a serious home cook. 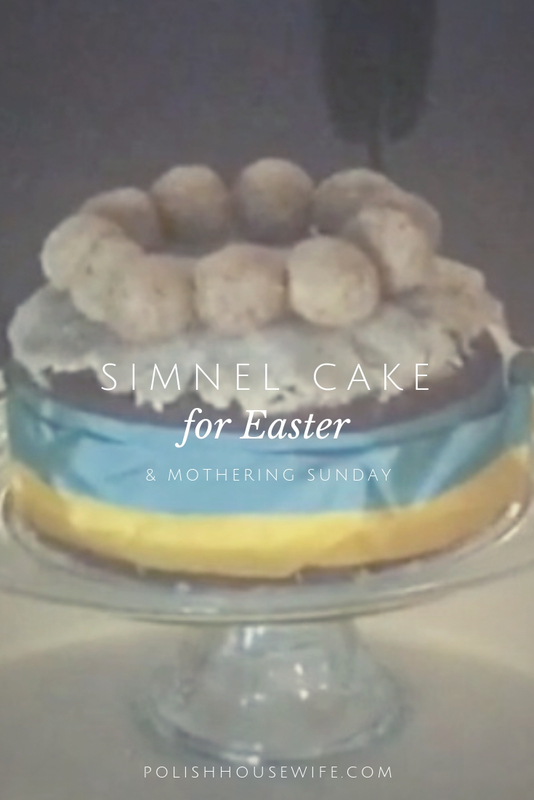 After hearing about Simnel Cake, I had the opportunity to taste one Erich had made. It was amazing! The kind of cake calls to you from the break room while you try to keep focused on your work. 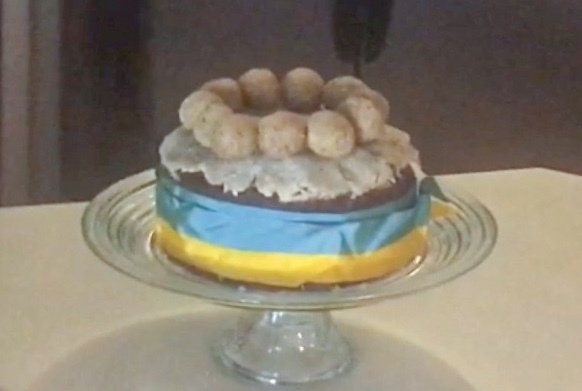 It’s the kind of cake that makes a Polish food blogger decide to do an English recipe. It’s that good, and I had to share it with you! Erich, whom I think is ready for his own cooking show, invited me over one summer day to video the process and enjoy the finished product. The video isn’t a Tasty style “hands and pans” 60-second wonder. It’s the two of us hanging out in his kitchen chatting as he makes the cake. I had to pare it down a lot, and I still ended up with four videos to give me lengths that can be uploaded! I know how actors feel when their best work ends up on the cutting room floor. So much witty repartee lost! The 4th Sunday is Lent is known as Laetare Sunday (a day for celebration and relaxing of Lenten observations), also Mothering Sunday in England, and other countries, as Erich explains to us in the first video. Simnel Cakes have been around since medieval times. These lovely fruitcakes, have two layers of marzipan, one in the middle of the cake batter, and another on top. They’re topped with 11 or 12 balls or eggs of marzipan. I absolutely love marzipan, so it was a nice surprise to see how easy it is to make it yourself! Erich uses a tall cake pan. I imagine you could also use a spring-form pan, 9 or 10 inch. The bottom and sides are buttered and lined with paper, parchment or in this case, brown craft paper which worked perfectly. I imagine the sturdiness of the brown craft paper was even better suited for the job than parchment would have been. The batter is a simple process, creaming your butter and sugar, adding eggs, flour, and candied peel as well as dried fruit. Erich adds to the normal recipe by using dried fruit that has been soaked in rum or brandy. Unless you just don’t want to use alcohol, plan ahead to cover the dried fruit in some kind of booze for a couple of hours or overnight. It’s a wonderful addition to the flavor, and the rum or brandy that you strain off will pick up some of the fruit taste too. Because this is such a big, moist, dense, cake. It bakes for three hours and takes a long time to cool. It’s not difficult to prepare, but it’s not quick! The first layer of your homemade marzipan has been baked in the cake, sandwiched between two layers of cake batter. The second layer goes on top, decorated with marzipan balls that can be given a bit of color with a blow torch. Before we move on to the recipe, let me try to describe the taste and texture of this cake for you, it’s not too sweet, it’s moist, it’s dense, it’s a blend of wonderful flavors, boozy fruit and marzipan, sheer joy! Sounds absolutely amazing! Happy Easter (soon)!